(Francisco Kjolseth | The Salt Lake Tribune) Vice President Joe Biden speaks at Kingsbury Hall on the University of Utah campus on Thursday, Dec. 13, 2018, as part of the MUSE (My U Signature Experience) Project, a university presidential initiative meant to enrich undergraduate education across the U. (Francisco Kjolseth | The Salt Lake Tribune) A packed house fills Kingsbury Hall on the University of Utah campus to hear Vice President Joe Biden speak on Thursday, Dec. 13, 2018, as part of the MUSE (My U Signature Experience) Project, a university presidential initiative meant to enrich undergraduate education across the U. (Francisco Kjolseth | The Salt Lake Tribune) A video plays a short history of Vice President Joe Biden before he takes to the stage to speak at Kingsbury Hall on the University of Utah campus on Thursday, Dec. 13, 2018, as part of the MUSE (My U Signature Experience) Project. (Francisco Kjolseth | The Salt Lake Tribune) A video plays a short history of Vice President Joe Biden before he takes to the stage to speak at Kingsbury Hall on the University of Utah campus on Thursday, Dec. 13, 2018, as part of the MUSE (My U Signature Experience) Project. (Francisco Kjolseth | The Salt Lake Tribune) Vice President Joe Biden remarks I am most proud of not one skinny hint of scandal in eight years, as he gestures while speaking at Kingsbury Hall on the University of Utah campus on Thursday, Dec. 13, 2018, as part of the MUSE (My U Signature Experience) Project, a university presidential initiative meant to enrich undergraduate education across the U. 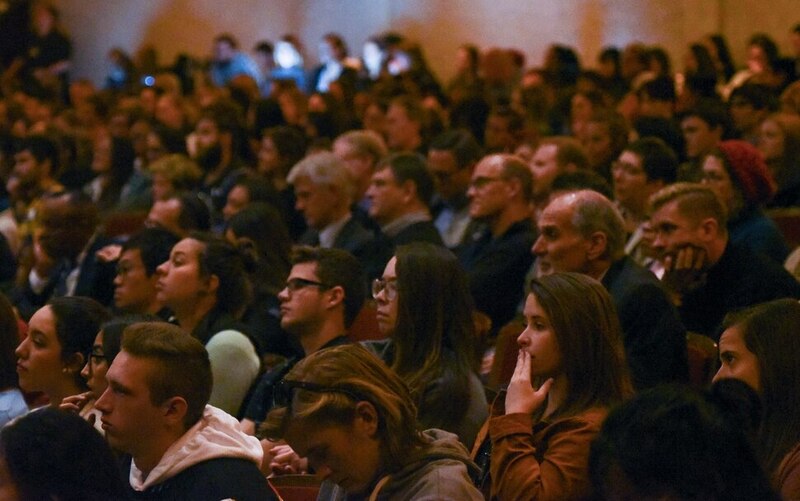 (Francisco Kjolseth | The Salt Lake Tribune) Second year student Isabelle Schlegel joins a packed house at Kingsbury Hall on the University of Utah campus to hear Vice President Joe Biden speak on Thursday, Dec. 13, 2018, as part of the MUSE (My U Signature Experience) Project, a university presidential initiative meant to enrich undergraduate education across the U. (Francisco Kjolseth | The Salt Lake Tribune) Vice President Joe Biden praises Huntsman Cancer Institute Chief Executive Officer. Mary Beckerle at Kingsbury Hall after he was introduced by her on the University of Utah campus on Thursday, Dec. 13, 2018, as part of the MUSE (My U Signature Experience) Project speaking engagement. (Francisco Kjolseth | The Salt Lake Tribune) Vice President Joe Biden joins Prof. Mark Matheson onstage as he speaks at Kingsbury Hall on the University of Utah campus on Thursday, Dec. 13, 2018, as part of the MUSE (My U Signature Experience) Project, a university presidential initiative meant to enrich undergraduate education across the U. (Francisco Kjolseth | The Salt Lake Tribune) Joanna Neal, originally from Delaware much like Vice President Joe Biden, brings her book for signing as she lines up with others outside Kingsbury Hall on the University of Utah campus on Thursday, Dec. 13, 2018. The former vice president was speaking as part of MUSE (My U Signature Experience) Project, a university presidential initiative meant to enrich undergraduate education across the U. (Francisco Kjolseth | The Salt Lake Tribune) Vice President Joe Biden speaks at Kingsbury Hall on the University of Utah campus on Thursday, Dec. 13, 2018, as part of the MUSE (My U Signature Experience) Project, a university presidential initiative meant to enrich undergraduate education across the U. (Francisco Kjolseth | The Salt Lake Tribune) Vice President Joe Biden joins Prof. Mark Matheson onstage as he speaks at Kingsbury Hall on the University of Utah campus on Thursday, Dec. 13, 2018, as part of the MUSE (My U Signature Experience) Project, a university presidential initiative meant to enrich undergraduate education across the U. (Francisco Kjolseth | The Salt Lake Tribune) Vice President Joe Biden joins Prof. Mark Matheson onstage as he speaks at Kingsbury Hall on the University of Utah campus on Thursday, Dec. 13, 2018, as part of the MUSE (My U Signature Experience) Project, a university presidential initiative meant to enrich undergraduate education across the U. (Francisco Kjolseth | The Salt Lake Tribune) Vice President Joe Biden joins Prof. Mark Matheson onstage as he speaks at Kingsbury Hall on the University of Utah campus on Thursday, Dec. 13, 2018, as part of the MUSE (My U Signature Experience) Project, a university presidential initiative meant to enrich undergraduate education across the U. (Francisco Kjolseth | The Salt Lake Tribune) Vice President Joe Biden speaks at Kingsbury Hall on the University of Utah campus on Thursday, Dec. 13, 2018, as part of the MUSE (My U Signature Experience) Project, a university presidential initiative meant to enrich undergraduate education across the U. (Francisco Kjolseth | The Salt Lake Tribune) People line up outside Kingsbury Hall on the University of Utah campus on Thursday, Dec. 13, 2018, to hear Vice President Joe Biden speaks. (Francisco Kjolseth | The Salt Lake Tribune) Vice President Joe Biden speaks at Kingsbury Hall on the University of Utah campus on Thursday, Dec. 13, 2018, as part of the MUSE (My U Signature Experience) Project, a university presidential initiative meant to enrich undergraduate education across the U. (Francisco Kjolseth | The Salt Lake Tribune) Vice President Joe Biden speaks at Kingsbury Hall on the University of Utah campus on Thursday, Dec. 13, 2018, as part of the MUSE (My U Signature Experience) Project, a university presidential initiative meant to enrich undergraduate education across the U. (Francisco Kjolseth | The Salt Lake Tribune) University of Utah President Ruth Watkins welcomes those gathered for Vice President Joe Biden as he gets ready to speaks at Kingsbury Hall on the University of Utah campus on Thursday, Dec. 13, 2018, as part of the MUSE (My U Signature Experience) Project, a university presidential initiative meant to enrich undergraduate education across the U. (Francisco Kjolseth | The Salt Lake Tribune) Vice President Joe Biden speaks at Kingsbury Hall on the University of Utah campus on Thursday, Dec. 13, 2018, as part of the MUSE (My U Signature Experience) Project, a university presidential initiative meant to enrich undergraduate education across the U. (Francisco Kjolseth | The Salt Lake Tribune) Vice President Joe Biden joins Prof. Mark Matheson onstage as he speaks at Kingsbury Hall on the University of Utah campus on Thursday, Dec. 13, 2018, as part of the MUSE (My U Signature Experience) Project, a university presidential initiative meant to enrich undergraduate education across the U. (Francisco Kjolseth | The Salt Lake Tribune) Vice President Joe Biden praises Huntsman Cancer Institute Chief Executive Officer. Mary Beckerle at Kingsbury Hall after he was introduced by her on the University of Utah campus on Thursday, Dec. 13, 2018, as part of the MUSE (My U Signature Experience) Project speaking engagement. (Francisco Kjolseth | The Salt Lake Tribune) Vice President Joe Biden joins Prof. Mark Matheson onstage as he speaks at Kingsbury Hall on the University of Utah campus on Thursday, Dec. 13, 2018, as part of the MUSE (My U Signature Experience) Project, a university presidential initiative meant to enrich undergraduate education across the U. (Francisco Kjolseth | The Salt Lake Tribune) Vice President Joe Biden joins Prof. Mark Matheson onstage as he speaks at Kingsbury Hall on the University of Utah campus on Thursday, Dec. 13, 2018, as part of the MUSE (My U Signature Experience) Project, a university presidential initiative meant to enrich undergraduate education across the U. 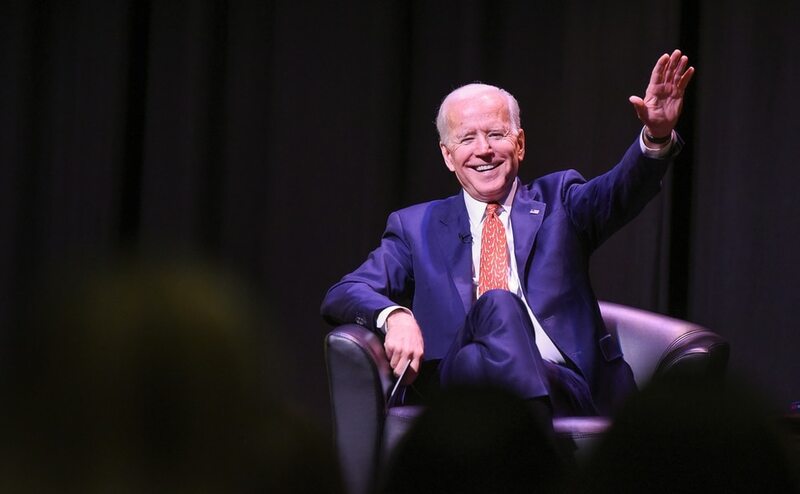 Former Vice President Joe Biden told a packed house at the University of Utah on Thursday that he’s “found his purpose” in life but didn’t reveal whether that includes another presidential run. The roughly hourlong question-and-answer session will likely be Biden’s final public appearance of the year, and he used it to speak about his upbringing, his first years in politics and the 2015 death of his son, Beau. During his illness, Beau Biden made his father promise not to let grief rob him of purpose in life. The vow — echoed in the title of Joe Biden’s new memoir, “Promise Me, Dad: A Year of Hope, Hardship, and Purpose” — was interpreted by some as an indication that the longtime U.S. senator from Delaware would launch a Democratic bid for the nation’s highest office. But Biden said the promise was simply about staying “engaged in the things that animate your life.” Since his son died of brain cancer, Biden said he’s tried to live up to that goal. "For the first year and a half, there wasn’t a day I woke up and I didn’t ask myself ... ‘Is he proud of me? Is he proud that I am staying engaged?’ " Biden said. The moderator, professor Mark Matheson, said he opted not to question Biden about a 2020 presidential run because he wanted to focus on values and human issues rather than politics. The decision to sidestep the issue was made voluntarily, Matheson said, and Biden’s visit was not conditioned on it. The former vice president has been on tour promoting his new book and has been dropping occasional comments about his political future along the way. At an event earlier this month in Montana, Biden labeled himself the most qualified person in the country to be president, the Associated Press reported. The AP has also reported that Biden will convene with his family members over the holidays as he considers a possible presidential campaign. Biden, 76, has already run twice for the post and has said he won’t make a decision about a third bid until January. 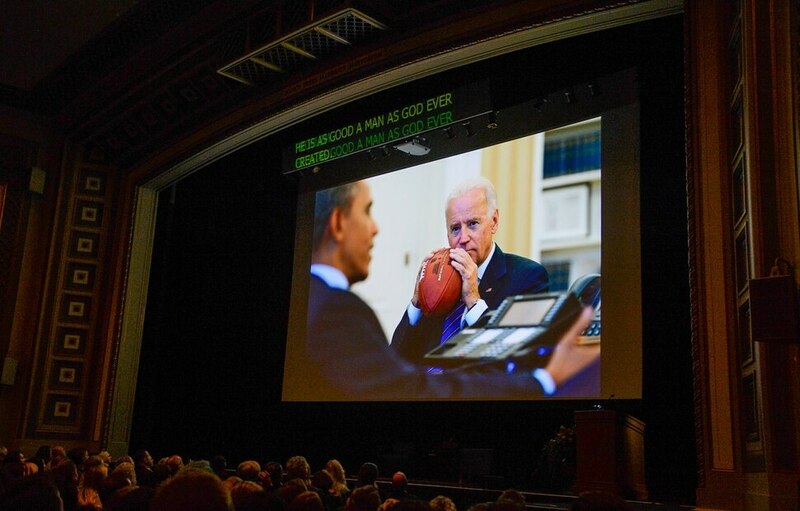 Biden's appearance to a capacity crowd in the 1,800-seat Kingsbury Hall was part of the university's MUSE (My "U" Signature Experience) Project, which plans events for student enrichment. Mary Beckerle, CEO of the Huntsman Cancer Institute, introduced Biden and spoke glowingly of the former vice president's support of cancer research. Beckerle served on Biden's Cancer Moonshot Blue Ribbon Panel, a group that crafted recommendations for making rapid advancements in cancer diagnosis, prevention and treatment. Biden called himself a "great admirer of the LDS" and said one of his greatest honors was spending an afternoon with 11 of the 12 apostles for The Church of Jesus Christ of Latter-day Saints. He also expressed respect for former Utah Gov. Jon Huntsman, who's now working as the U.S. ambassador to Russia. He also shared the story of his decision to become former President Barack Obama’s running mate, saying he initially leaned against joining the ticket but changed his tune after speaking with his family. During the family meeting, Biden's elderly mother began by reminding him of times when he'd shown a commitment to racial justice and rooting out intolerance before delivering her punchline: "Honey, the first African American in American history that has a chance to be president of the United States says he needs you to win Pennsylvania, Ohio, Michigan, Colorado and Florida. And you told him no, honey?" During Thursday’s event, Matheson revealed that Biden had waived his speaking fee for the U. appearance, although he wouldn’t disclose what the honorarium would’ve been.